Conrad commands mythical armies in The Creative Assembly's second turn-based strategy and real-time tactics take on the Warhammer universe. For older gamers, Warhammer was a rite of passage. Before PlayStation and PC, there was paint and plastic. Every nascent gamer had at some point in their lives been exposed to the Games Workshop universe. 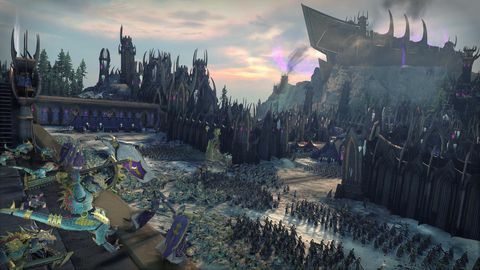 So, when The Creative Assembly teamed up with Games Workshop in 2016 to bring the Total War: Warhammer series to life, strategy and fantasy gamers everywhere sat up and took notice. Now, one year on from the well-received launch of that breakout title, Creative Assembly is back at it again to bring us even more of its Total War/Warhammer mash-up. Warhammer II’s campaign sits as the jewel in this sequel’s crown. It takes a very different tack to that of the previous title, which was much more of a 'choose your own adventure' and 'seize all the territory you can' kind of affair. By contrast, Warhammer II has taken a more narrative-driven path. 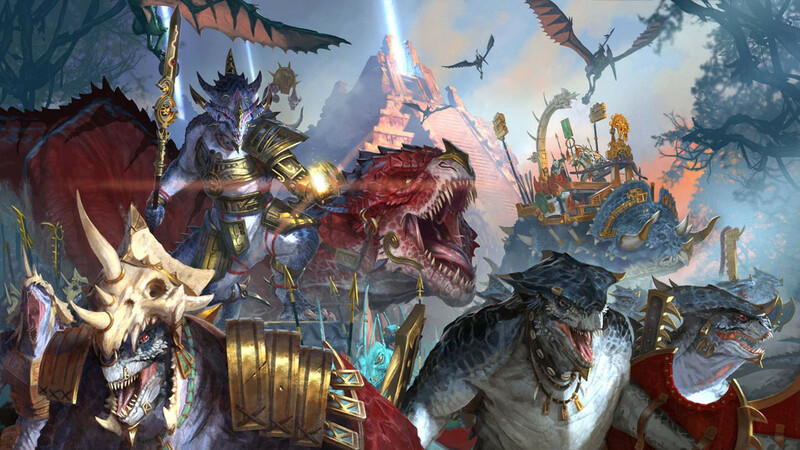 Each race — most of which were not playable in Warhammer 1 – must compete against each other not just for cities and loot, but also for control of the Great Vortex, a portal through which chaotic magic is gathered and flushed out of the material world and back into the Realm of Chaos. The Vortex sits at the centre of the Isle of Ulthuan, the ancestral home of the elven race, and the setting for the game. This race for control is done in a very clever way. Each race has a specific resource which they must collect – for example, dark elves must gather the Hekarti Scrolls, and once they have enough, these scrolls trigger "rituals" which push forward their storyline and also inch them closer to control of the Vortex. This new "race to the vortex" adds significantly more tactical depth to the campaign, and overtakes the battle map in terms of intensity and interest. Once a ritual is underway, you must defend your empire while your mages and sorceresses conduct the ritual, and if your enemies have their own rituals on the go, you can hire armies to intervene and mess with their magic. It’s a great campaign development, as it adds an ongoing sense of haste and gives you a real and tangible goal to push towards beyond simply crushing enemies and taking all of their stuff. These resources also serve another purpose: they can also be used to perform empire-specific rites which provide bonuses. Much like the province-wide buffs that the previous Warhammer and other modern Total War titles have had, these rites help you to control your empire’s problems, and buff it in a time of need. Thankfully, Creative Assembly made the wise decision to have these scrolls stay unconsumed, meaning you don’t need to make the Hobson’s choice between buffing your empire and hoarding resources to advance your storyline. However, these quirky campaign map developments hide what is becoming an increasingly cluttered user interface. 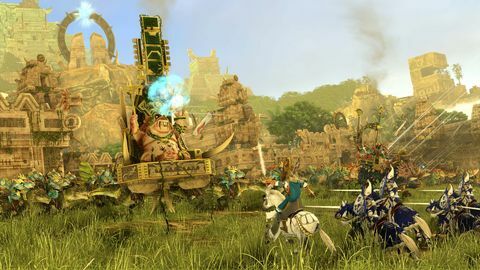 It is no exaggeration that the Total War series is starting to look a lot like Sid Meier’s Civilization – Warhammer II has a very, very busy campaign map. Aside from the usual clutter of advisors and notifications, the game throws in even more events, diplomatic incidences, tech trees, and other matters requiring attention. Some additions, such as the clever homage to the 'pick a path' adventures of old, are welcome. But Creative Assembly needs to do some serious thinking about how to present this new world to players. The campaign map style, which has not changed much in fundamental design since Rome 2, drastically needs an overhaul. The consequence of all of this is that while Warhammer II does give players much more depth and variety in the campaign map, it also adds a frustrating level of administration. Old school Total War players will probably relish the challenge, but newer players could be put off by its inaccessible complexity. It’s a problem the Total War series as a whole has been slowly sleepwalking towards, and it needs urgent attention. All that being said, you can’t fault the thought that has gone into the Warhammer world. The maps ooze with chaos corruption, the verdant jungles of the lizardmen hum and shimmer, and the purple vortex of the high elves twists and twirls with every turn. 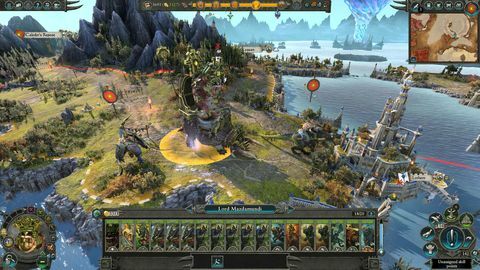 The geography is phenomenal, and its clever integration into both the strategy of Warhammer II and the tactical choices players must face in each battle has been handled incredibly well. 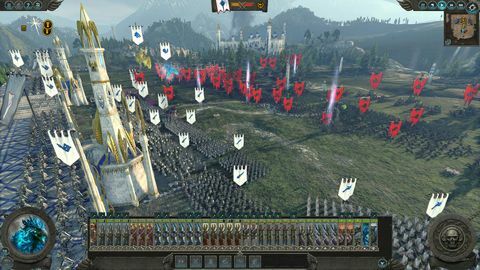 True to form, Warhammer II’s battles do not disappoint. How could they, when dark elves go toe-to-web with lizardmen, and harpies to swoop down on marauding trolls? The Creative Assembly team has done an excellent job of bringing the look and feel of the table-top world to life within the boiler pot battle simulator for which the series is now famous. Each combat exchange is a mini Waterloo. However, here too some of the game choices could do with improvement. The hero and lord mechanic from the first Warhammer is used to full effect, but these units can often become superheroes in their own right. While it is understandable that a legendary dark elf can cast spells, and take down larger foes, it does become frustrating to see them mow down entire enemy units without taking a so much as a scratch. It’s also disappointing to see how ordinary – but still incredibly interesting – units are not provided with greater tactical options. This is an area where Creative Assembly could have taken more from the table-top source material, and where there is something clearly lost in the translation from turn-based dice combat to real-time action. There is ample room for experimentation. Where there has been a push for innovation is in the handling of multiplayer gameplay. Creative Assembly has responded to fan requests for greater depth and delivered a mixed bag of options. The option for large four-way free-for-all battles is included, and players can also team up or to go head-to-head in the campaign map. These are welcome additions, as even though the game’s single-player AI has been tweaked, there is no match for a truly cunning human opponent. Creative Assembly has once again put together an impressive and immersive Total War title. Warhammer II is a very good addition to the Warhammer: Total War collaboration, and fans of the first will be incredibly pleased with the second. Its focus on intelligent campaigns, immersive battles, and multiplayer make it a great addition to the canon. However, you can’t help get the feeling that The Creative Assembly is resting on its laurels. The Warhammer universe has given it a rich seam to mine, but it is coming at the cost of hard choices about the future direction of the series and what innovation needs to happen to get it there. Warhammer II serves up a delicious example of a tried and true formula, but Creative Assembly still has some thinking to do if it wants the series to continue to prosper. Ups Great campaign depth. Interesting narrative driven campaign. Excellent battles. New races with new traits and abilities. More multiplayer options. Downs A hard to understand and complicated campaign map. Clunky user interface. Lack of innovation in the battle simulator. Multiplayer shelf life seems limited.